We’d love your help. Let us know what’s wrong with this preview of The Quintland Sisters by Shelley Wood. In Shelley Wood’s fiction debut, readers are taken inside the devastating true story of the Dionne Quintuplets, told from the perspective of one young woman who meets them at the moment of their birth. Reluctant midwife Emma Trimpany is just 17 when she assists at the harrowing birth of the Dionne quintuplets: five tiny miracles born to French farmers in hardscrabble Northe In Shelley Wood’s fiction debut, readers are taken inside the devastating true story of the Dionne Quintuplets, told from the perspective of one young woman who meets them at the moment of their birth. Reluctant midwife Emma Trimpany is just 17 when she assists at the harrowing birth of the Dionne quintuplets: five tiny miracles born to French farmers in hardscrabble Northern Ontario in 1934. Emma cares for them through their perilous first days and when the government decides to remove the babies from their francophone parents, making them wards of the British king, Emma signs on as their nurse. Over 6,000 daily visitors come to ogle the identical “Quints” playing in their custom-built playground; at the height of the Great Depression, the tourism and advertising dollars pour in. While the rest of the world delights in their sameness, Emma sees each girl as unique: Yvonne, Annette, Cécile, Marie, and Émilie. With her quirky eye for detail, Emma records every strange twist of events in her private journals. To ask other readers questions about The Quintland Sisters, please sign up. Heartwarming and heartbreaking emotion. Brilliant and beautiful narration. Shocking and unforgettable detail. This story is a stunning look into the lives of the world’s first quintuplets born in Callander, Ontario, Canada in 1934. Yvonne, Annette, Cecile, Marie and Emilie Dionne shock their parents and the attending doctor and midwives on the day of their birth – five babies instead of one!?!? So tiny and frail, they are not expected to survive the night of their birth. Emma Trimpany is 5+ stars! Emma Trimpany is seventeen-years-old when she accepts the request to accompany and assist the local midwife in attending a birth at the rundown Dionne farmhouse. This single decision changes her life forever, leaving her heart with a permanent longing and attachment to these five babies. Days after their birth, in the confines of the rickety old farmhouse, the Dionnes’ learn that the government has decided to remove the quintuplets from their poverty-stricken parents, making them wards of the British king. Guardians are appointed and the babies are moved to a custom-built, sterile hospital to keep them safe and properly cared for by full time doctors and nurses. The quintuplets attain instant worldwide fame becoming a destination for six-thousand visitors per day in their custom-made playground observatory at the hospital. Through many ups and downs, Emma spends the next several years of her life dedicated to these five little girls who each uniquely own a piece of her heart. This novel is skillfully narrated through journal entries, letter correspondence and newspaper articles. Readers get to experience the childhood of the “Quints” through the eyes of Emma, an endearing, vulnerable and truly unforgettable character who I absolutely loved and was hopeful for. I was completely drawn into this story from the first few pages and my astonishment didn’t falter even after I finished the last sentence. The author, Shelley Wood, does an outstanding job weaving fact and fiction, keeping the reader dedicated and emotionally connected to the characters and the outcome. The Epilogue was exquisite, although not at all what I had expected. It left some things unanswered which was brilliant as it enticed me to do some research of my own. I am eager to investigate further into the story of the Dionne quintuplets and how the government stepped in to control their precious lives. This reading experience has left me baffled and curious in the best of ways – this is a true testament to phenomenal writing and storytelling. A truly remarkable novel! I loved every single chapter, page, paragraph, sentence and word of this endearing story. This easily takes top spot of my 2019 Favourites List! Needless to say, I HIGHLY recommend! Thank you to HarperCollins for gifting me a physical copy to read and review! What a mixed bag! The writing itself is excellent and the plot is compelling as all get out. I didn't want to put it down...except for when I wanted to throw it out the window. a. Oliva Dionne was NEVER in favor of charging the public admission to see the quints. I don't understand how you could do as mu What a mixed bag! The writing itself is excellent and the plot is compelling as all get out. I didn't want to put it down...except for when I wanted to throw it out the window. a. Oliva Dionne was NEVER in favor of charging the public admission to see the quints. I don't understand how you could do as much research as Shelley Wood has obviously done, and not know that. He was the only member of the board of guardians who opposed the entire idea of letting the public view the quints, let alone charging for it, and Wood misrepresents that so completely, I just...couldn't even. b. It's true that Elzire Dionne was a large woman, but do we really need to be told more than once or twice? Wood seems to be using Mme. Dionne's weight to make her unworthy of sympathy. Mme. Dionne lumbers, waddles, mutters, and snarls. When she's giving birth to quintuplets, she's described as "hardly human — mounds of oily flesh, juddering in pain." If that's not enough, she also gets compared to a sofa cushion and a tractor, and it just feels mean. She only died bout 20 years ago, which means she still has living children and grandchildren who remember her. I sure wouldn't like to read descriptions like that about my grandma, no matter how big she was. Mrs. Dionne may have had unpleasant sides to her character, but I think Wood is a good enough writer that she could have illustrated them a lot more respectfully. Fantastic! Not only a very compelling novelization of the birth and early lives of the Dionne Quintuplets, but a very moving coming of age/love story that was dazzlingly handled/revealed in the last 50 or so pages. What an epic look at human nature and fate. This book is enjoyable on many, many levels. I don't think anyone will be disappointed if they pick it up. Loved it! I had never heard of the Dionne Quintuplets until this book. I did some research and reading up on these famous sisters after reading this book. There was not a lot of details on the sisters and thus for what little details there were, I thought author, Shelley Wood did a good job with this book. It helped explain why there was not a lot of details spent on the sisters in this book. That was one factor that had left me craving more. I wanted to get to know more about each sister and their person I had never heard of the Dionne Quintuplets until this book. I did some research and reading up on these famous sisters after reading this book. There was not a lot of details on the sisters and thus for what little details there were, I thought author, Shelley Wood did a good job with this book. It helped explain why there was not a lot of details spent on the sisters in this book. That was one factor that had left me craving more. I wanted to get to know more about each sister and their personalities. The heart-wrenching story of five identical little girls born to a poor family in Ontario, lovingly told through the eyes of a young woman who was present at the birth and stayed on to help these girls grow and thrive, despite the fact that hundreds of people came every day to see this miracle of birth. These French Canadian girls were the first quints known to have survived infancy, against the overwhelming odds. They were removed from their parents' home, as it was thought the parents had neit The heart-wrenching story of five identical little girls born to a poor family in Ontario, lovingly told through the eyes of a young woman who was present at the birth and stayed on to help these girls grow and thrive, despite the fact that hundreds of people came every day to see this miracle of birth. These French Canadian girls were the first quints known to have survived infancy, against the overwhelming odds. They were removed from their parents' home, as it was thought the parents had neither the resources nor the ability to care for them. Under government watchfulness, the girls' lives and finances were carefully controlled. I am fascinated by them, as I was born on the same day: May 28. I grew up hearing stories about these five sisters, which were particularly interesting to me, since I was an only child. This well-written story, lovingly told, will grab at your heart. I have heard of the Dionne Quints but didn't realize how the sisters were put on display like zoo animals and the money that was made from their existence. This is a heartbreaking and hard to put down debut novel. I ended up doing some research of my own to read about their lives after the book ended. This started out strong, then gradually drifted off the rails. This genuinely just felt like a personal project, unplanned, unedited, that Wood wrote and wrote and wrote for fun until she got bored and then dropped the thing. It was nice and relaxing to read about this cozy, charming little life, but it never had a point, and that gets exhausting when your book is nearly 500 pages. I lost my patience (but hey...not my hope) at about 60%, and sadly never offered much more than what I was initially given. When I first saw this novel I was intrigued by the cover because of the history and the sensationalism of the story in Canadian history and around the world. Wood does a really good job of blending a fictional story with the factual account of the Dionne quintuplets born in the 1930s at a time when their survival rate would have been slim. Wood creates the wonderful and interesting character Emma Trimpany who finds herself at the Dionne house the night the quints are born. The novel is a series When I first saw this novel I was intrigued by the cover because of the history and the sensationalism of the story in Canadian history and around the world. Wood does a really good job of blending a fictional story with the factual account of the Dionne quintuplets born in the 1930s at a time when their survival rate would have been slim. Wood creates the wonderful and interesting character Emma Trimpany who finds herself at the Dionne house the night the quints are born. The novel is a series of letters, diary entries and newspaper clippings of the events that gripped a nation just before the emergence of WWII. Emma is a highly likable character who really grows as the novel progresses. Born with an unusual port wine birthmark which she views as a defect, Emma shies away from the limelight but her natural artistic talents emerge and are noticed the more time she spends working at Quintland. Woods also paints vivid character portraits of all five of the quints, capturing their unique personalities along with the staff that moves in and out of the nursery hospital including one of their guardians Dr. Dafoe. If you've followed my reviews or my blog for any length of time, you may know that I have twin girls. They are identical and we get a lot of attention when we go out. I can't begin to imagine what it would be like to have quintuplets and the uproar that it would still cause today. The Dionne family had people parking outside of their home waiting to catch a glimpse of the babies napping. Even from their earliest days, the Dionne sisters' lives are strange. I liked how the author was able to capture the uproar that constantly seems to thrum in the background of the girls' lives. I liked that the book was narrated by Emma, a nurse whose first taste of nursing comes from helping to deliver the Dionne girls. She loves these girls and is protective of them as much as she can be. I really enjoyed seeing things through her eyes. We see as the girls' lives are upended over and over again throughout the book. People like Emma become some of the only constants that they had. Long before Kate Plus Eight or the Octomom, there were the Dionne Quintuplets, the first quintuplets to survive their infancy. They were born in French-speaking, rural Canada in 1934. Their parents had five other children. They were shamed for it. People also sent money and fan mail. The government took custody of the girls, leading to many disputes over the years. A doctor and his crew of nurses took over care of the girls. The Quintland Sisters tells the story of the first few years of the qui Long before Kate Plus Eight or the Octomom, there were the Dionne Quintuplets, the first quintuplets to survive their infancy. They were born in French-speaking, rural Canada in 1934. Their parents had five other children. They were shamed for it. People also sent money and fan mail. The government took custody of the girls, leading to many disputes over the years. A doctor and his crew of nurses took over care of the girls. The Quintland Sisters tells the story of the first few years of the quintuplets lives from the perspective of a young woman, Emma Trimpany, who works as a nurse to the girls. Born with a large birthmark on her face, Emma is used to being overlooked and disregarded. “This is something I’ve managed to pull off my whole life, to make myself invisible and unremarkable—no mean task with a crimson stain covering half my face.” Her mother sends her over with the midwife the night that the quints are born, thinking it might be a suitable profession for her disfigured daughter. Emma gets sent to nursing school so that she’s properly trained to assist in their care. She becomes attached to the girls and friendly with several nurses, particularly Yvonne Leroux (known to everyone as Ivy), who she remains friends with even after she leaves. We’re told the story through journal entries, letters and news reports. Emma draws pictures of the girls which she ends up selling to advertisers. She’s talented and someone suggests she apply to art school. It’s a superb way to tell this story through the fictional Emma interacting with the real-life team. It’s fascinating to read about their care. Can you imagine caring for so many infants? It definitely takes a team. No one even believed they’d survive past the first week. It was humorous to read the doctor and some of the nurses commenting on the likelihood of the girls’ survival. They gave one of the girls rum to “stimulate” her heart. Before they received a shipment of breast milk, the girls were fed a mix of corn syrup, cow’s milk and boiled water. They kept records of everything. The quintuplets generated lots of income from visitors as well as through endorsements. It’s not a new Instagram era thing to earn money this way. There was a court case between several corn syrup companies to determine who would have exclusivity. [“The ridiculous thing is, we don’t even feed the babies corn syrup. Dr. Blatz believes sugar in any form is bad for children. I should tell that to the newspapers.”] Several films were made about them. There was a custom-built playground that allowed for spectators. There were 6, 000 daily visitors! Celebrities such as Amelia Earhart visited. They sold souvenirs! It was a real money-making business. Unfortunately, not everyone cared for the girls and their future. Celebrity and money attract deceitful people wanting to take advantage of the situation. Many nefarious incidents occurred over the years. It’s a meticulously researched novel and why I’m a fan of historical fiction. I love having a fictional character introduce me to real people and actual events. I really want to know what happened to the quintuplets as adults. I made myself not Google while reading. What were their lives like at that time? I might read one of the nonfiction books about them to garner more information. I knew almost nothing about the Dionne Quintuplets before reading The Quintland Sisters, so I devoured this book as a novel, not as historical fact. I loved it—the mix of diary entries and newspaper articles (which I gather were real) made for a fascinating blend of fact and fiction and it made me, as a reader, have to do some of the work to fill in the gaps, which I always love in a book. 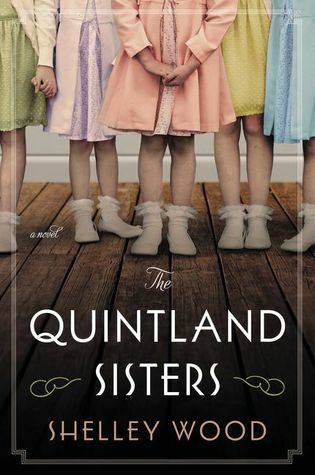 The plot is fast and compelling, with a constant hint of foreboding, and the characters were beautifully dr I knew almost nothing about the Dionne Quintuplets before reading The Quintland Sisters, so I devoured this book as a novel, not as historical fact. I loved it—the mix of diary entries and newspaper articles (which I gather were real) made for a fascinating blend of fact and fiction and it made me, as a reader, have to do some of the work to fill in the gaps, which I always love in a book. The plot is fast and compelling, with a constant hint of foreboding, and the characters were beautifully drawn, with just enough details that I could fill in the rest, especially when it is obvious that Emma is judging people based on their looks or actions like a typical teenager. Emma is definitely an “unreliable narrator” or maybe more of a “naïve narrator”: watching her subtly change her impressions of who is doing the “right” thing by the quintuplets over the course of the novel felt, to me, to be very true to life. Her description of the birth at the beginning is exactly the kind of reaction I think any 17-year old girl would have, but by the end of the novel she has acquired a wisdom or at least an uncertainty about people and events that to me rang true. The climax of the book I did not see coming, but when I went back and re-read certain sections I realized that I was a bit like Emma, only seeing the things I wanted to see, caught up in my chosen story line. I, of course, went and googled as much as I could about the quintuplets after finishing the book and I was so sorry to hear what happened to them when they were finally reunited with their family. That happened some time after the period covered in the novel, but I can imagine how it must have influenced the author who would have wanted to find a way to hint at the future while only writing about the first five years. And then the world seemed to completely forget about them, which is a travesty. As a work of fiction, this is a fast and fascinating read and hopefully will inspire people to go out and learn more about their true story. Overall, I thought The Quintland Sisters was sometimes sad and upsetting, and at other times really sweet and beautiful, which seems to me an accurate echo of the real lives of the Dionne girls. As a Canadian, I’ve grown up knowing SOMETHING about the Dionne quintuplets. I knew they were important. I knew they were famous. I knew they were French Canadian. But they were born long before I was, and test tube babies were the excitement when I was old enough to think about babies - and that was about it for the Dionne Quints for my Canadian consciousness. Shame on me. So when I spotted Shelley Wood’s novel, “The Quintland Sisters”, I quickly jumped on the chance to refamiarize myself with As a Canadian, I’ve grown up knowing SOMETHING about the Dionne quintuplets. I knew they were important. I knew they were famous. I knew they were French Canadian. But they were born long before I was, and test tube babies were the excitement when I was old enough to think about babies - and that was about it for the Dionne Quints for my Canadian consciousness. Shame on me. So when I spotted Shelley Wood’s novel, “The Quintland Sisters”, I quickly jumped on the chance to refamiarize myself with this eventful - and apparently very conflicted- period surrounding the Dionne Quintuplets birth and lives. The author has inserted a fictional character, Emma Timpany, a young local who is at the birth and who goes on to become a nurse to the quints. Emma acts as a constant narrator and commentator throughout the novel, anchoring the history of the girls in time and to the other actual historical figures as they moved in and out of their lives. The device is beautifully done, with Emma incorporated so fluidly she seems to be part of the narrative. Interspersed as well are copies of clippings from newspapers, which add incredible drama to the fiction that author Wood fills in for us. The story flowed very well, is so compassionate and heartbreaking at the same time. I had no idea that the Dionne quints were a world wide phenomenon, that the World’s Fair wanted them to come as a display (! ), that they were in a facility where they were put to be “viewed” daily. Ugh. DeB MaRtEnS Mallee wrote: "Read their non-fiction version a long time back and found it fascinating so sure this will be good too"
I know that I’ve read about them Mallee wrote: "Read their non-fiction version a long time back and found it fascinating so sure this will be good too"
This was an extraordinary story based on true events! Born in 1934 to French farmers in a hardscrabble area of Northern Ontario, readers will experience firsthand the harrowing birth, the precarious first days, and then the scandals--how the babies are removed from the parents' custody, put on display (for profit), and more. The writing is largely first person, told from the POV of young Emma Trimpany, who is 17 in 1934, and a reluctant midwife to the babies. She has no training but is there the evening Mrs. Dionne goes into to labor. This beginning was absolutely gripping and had the ring of the BBC show, "Call the Midwife." Emma stays with the Dionne family and helps raise these girls--Annette, Yvonne, Emilie, Cecile, and Marie, even when other nurses are fired or leave, and when the Dafoe Nursery is built to house the children. Emma has an eye for art and detail and takes scrupulous notes (and sketches) in her 'scribble' journal. It's largely through this media that we get an inside peek at 'the girls' and their development. This technique has it's limitations, though as I never felt fully connected to either the quints or Emma, but I did get a good sense of what was going on in the world around. Peppered throughout THE QUINTLAND SISTERS is also newspaper articles and various (fictional) letters back and forth between Emma and her beau, Lewis, but also Emma and the first nurse, Yvonne "Ivy." Overall, THE QUINLAND SISTERS is a fictionalized journalistic approach to a real story, where some liberties are taken, and the end, well...I have mixed feelings. I definitely found similarities between THE QUINTLAND SISTERS and THE HOME FOR UNWANTED GIRLS (Joanna Goodman), especially in light of the Canadian setting and also perhaps the writing of Jamie Ford meets Kristina McMorris's SOLD ON A MONDAY. 3.75 total stars. For all my reviews, including author interviews, please see: www.leslielindsay.com |Always with a Book. Reality television – or any television – hadn’t been invented yet when the Dionne Quintuplets were born in Canada in 1934, but if it had been, their lives wouldn’t have been any less tragic, or crazy. Their story, as told by Emma Trimpany, a seventeen-year-old midwife-in-training, is the dichotomy of the the fish and the fishbowl. Inside, Emma sees each of the five “Quintland Sisters” – ripped from their family by the doctors who saw them as a means to fame and fortune – as a unique person, each Reality television – or any television – hadn’t been invented yet when the Dionne Quintuplets were born in Canada in 1934, but if it had been, their lives wouldn’t have been any less tragic, or crazy. Their story, as told by Emma Trimpany, a seventeen-year-old midwife-in-training, is the dichotomy of the the fish and the fishbowl. Inside, Emma sees each of the five “Quintland Sisters” – ripped from their family by the doctors who saw them as a means to fame and fortune – as a unique person, each with a name, a personality, her own personhood. But to outsiders it’s the similarities that attract, and people come from miles around to gawk at the girls in their specially-built playground. What struck me about this book, which is a fictional retelling of a true story, is how much the Dionne Quintuplets’ story is so similar to the stories we see today – the OctoMom media frenzy ended up with similar product placement opportunities, and, while not precisely the same, the Hensel twins (the famous conjoined twins) have likewise been media darlings their entire lives. Wood does an amazing job capturing the period, the Dionne family’s distress and confusion – sure, they’re uneducated and poor, but that doesn’t make them unfit parents. The juxtaposition of Depression-era austerity with the lavishness given to the girls, and not their parents was also quite well shown. I liked the device of using Emily as the point of view character, as she was closer in class to the Dionnes and closer in education to the doctors… she was the perfect betwixt-and-between person to let us see all perspectives. Overall, I found the story to be unsettling, but I believe that was the intent. It should be unsettling to read about children being treated more like an exhibition than people. I received this book from Goodreads in a giveaway, it is to be released March of 2019. This is historical fiction of the lives of the Dionne quintuplets from the point of view of their nurse Emma Trimpany. At four months of age they were made wards of the state for the next nine years under the Dionne Quintuplets' Guardianship Act, 1935. The Ontario provincial government and those around them began to profit by making them a significant tourist attraction. Almost 3,000,000 people walked through t I received this book from Goodreads in a giveaway, it is to be released March of 2019. This is historical fiction of the lives of the Dionne quintuplets from the point of view of their nurse Emma Trimpany. At four months of age they were made wards of the state for the next nine years under the Dionne Quintuplets' Guardianship Act, 1935. The Ontario provincial government and those around them began to profit by making them a significant tourist attraction. Almost 3,000,000 people walked through the gallery (their home) between 1936 and 1943 and brought in more than $50 million in total tourist revenue to Ontario. Their parents spent the entire time fighting for custody of the sisters. This book covers the years 1934 through 1939. The story starts out with the babies birth. Emma is a really easy character to listen to. She is very much focused on the babies and lets a little of the rest of the world go. I like the writing style. It has a nice smooth flow, and makes it easy to get into the story. Just the right amount of detail to set the scene, but also allows my imagination to fill in the complete picture. It drew me in from the first page and I had a hard time putting it down. The story is so fascinating, knowing that it is true made me want to research as I read. I found myself doing lots of google during and after in order to see pictures of the girls. I really enjoyed the interspersing of newspaper articles, the research for this book is superb. The entire story broke my heart from start to finish. Easily the best book I have read in the last few years! The Quintland Sisters is a fascinating look into the lives of Canada’s famous Dionne quintuplets. Born in the midst of the great depression, the Dionne quintuplets soon became a public obsession that lifted the public’s spirits during trying times. But at what cost to the girls? Emma Trimpany is a seventeen-year-old local girl who attends the birth of the Dionne quintuplets with the midwife to learn the trade. Madame Dionne did not know she would have five babies and Emma did not realize she was The Quintland Sisters is a fascinating look into the lives of Canada’s famous Dionne quintuplets. Born in the midst of the great depression, the Dionne quintuplets soon became a public obsession that lifted the public’s spirits during trying times. But at what cost to the girls? Emma Trimpany is a seventeen-year-old local girl who attends the birth of the Dionne quintuplets with the midwife to learn the trade. Madame Dionne did not know she would have five babies and Emma did not realize she was now a part of an extraordinary event. As she works to keep the five tiny infants alive, she becomes a caregiver through the years as the Canadian government takes them from their parents and raises them in a nursery across the street where they are put on the display for tourists. Emma keeps a diary of the strange events and also draws the girls as they grow. Does the family or the government have the best interest in the girls at heart? Who should raise the girls? Emma was born with a birthmark on her face and is trying to find her place in the world. Her parents do not want her to pursue her art, but instead want her to find steady employment during the great depression. Emma loves the girls, but she also wants romance in her life. Will Emma be able to find love and her place in the world? I had heard of the Dionne quintuplets, but I learned a lot in this novel, which overall, made me sad. The story ends with their visit to the queen as children and has a bit of a fast forward to when they are in their twenties. The novel left me thirsting for more information on the girls. Luckily at the end of the novel, Wood had an excellent author’s note and question and answer section that gave more information on the them. I was sad to hear that there isn’t much left when you visit where they grew up in northern Ontario. I was also intrigued that they were five identical babies as I didn’t realize that before. There still has not been a set of identical quintuplets that has made it to adulthood besides the Dionnes, which is an amazing feat. I enjoyed Emma’s story. I really liked the story of a woman trying to find her place in the world in the 1930’s. There were harsh realities of that time that were hard to live through. The novel is told as Emma’s first-person diary entries with news articles (mostly real, some edited) interspersed throughout the entries to give a fuller account. Emma is a fictional person in a real world, but her story itself was quite tragic. I got to the end and had to just sit in quiet for awhile I was so distressed. Overall, The Quintland Sisters is a fascinating look into tragic story of the Dionne Quintuplets and the life of women in the 1930’s. Book Source: Review Copy from William Morrow Books for being a part of the TLC Book Tour. Thank-you! All I really know about the Dionne siblings was from watching a late 1930s documentary that aired on them late one night when I was in college. I had forgotten most of the story, even when they were born. About 10% into this book -- and not particularly enjoying it anyway as it's not that skillfully written -- it suddenly occurred to me that one or more of the Dionne sisters might still be alive. I checked Wikipedia, and discovered that not only are two of them still living, but that they had al All I really know about the Dionne siblings was from watching a late 1930s documentary that aired on them late one night when I was in college. I had forgotten most of the story, even when they were born. If we emerge momentarily from the privacy we have sought all our adult lives, it is only to send a message to the McCaughey family. We three would like you to know we feel a natural affinity and tenderness for your children. We hope your children receive more respect than we did. Their fate should be no different from that of other children. Multiple births should not be confused with entertainment, nor should they be an opportunity to sell products. After reading in the wiki article what happened with them and their feelings about their privacy, I can't in good conscience even think about continuing to read this book. It just seems disrespectful and creepy. These women never asked for notoriety and suffered because of it. It's bad enough that their real lives have been used for entertainment without making up fiction about them while they or their children are still alive, especially if they did not give the project their blessing. Not sure how I felt about the ending like did the nurse ever talked to the girls again? It ended so abruptly and I just need MORE. But I really really liked this and I am not disappointed. I've always found the story of the Quints fascinating and tragic. Nobody had their best interests at heart, really. This historical fiction is written from the viewpoint of one of the nurses. It was a real page turner and I can highly recommend it. A very interesting read. I was captivated within the first 10 pages. I love fiction based off of real things like this too and this was really well done! First, I would like to say I was incredibly lucky to be given the opportunity to read an advanced copy in exchange for an honest review. I knew I wanted to read this book because, though I didn’t mention it to anyone except some family members, I actually grew up incredibly close to where the Dionne quintuplets (Yvonne, Annette, Marie, Cecile, and Emilie) were born, and so I’ve heard about them in passing my entire life. This includes seeing the old log cabin that was the family’s home turned in First, I would like to say I was incredibly lucky to be given the opportunity to read an advanced copy in exchange for an honest review. I knew I wanted to read this book because, though I didn’t mention it to anyone except some family members, I actually grew up incredibly close to where the Dionne quintuplets (Yvonne, Annette, Marie, Cecile, and Emilie) were born, and so I’ve heard about them in passing my entire life. This includes seeing the old log cabin that was the family’s home turned into a museum in its former location for many years on the ride to school. I also have driven many times on the highway built into a major highway (for the North) rather being kept as an old country road solely due to the tourism the Dionne quintuplets brought to the area. But before I keep talking about all of that, I’d like to focus back on the book and what I thought of this presentation of their story. This book tells the story of the Dionne quintuplets’ birth and their first years of life through the eyes of a young, sometimes naïve woman named Emma Trimpany. Emma, as I gather, is a fictional character, but of course, many individuals featured in the story are not, including Dr. Dafoe. As I read the book, I noticed where the author has clearly done research and where she has taken some liberties or extrapolated based on limited information. While yes, this is historical fiction, I think as a whole The Quintland Sisters is a remarkable novel and does, even if some specifics had to be invented, adheres to the tone of what I already knew about the Dionne quintuplet sisters and their story. It’s an interesting ride this book, just as the real story of the quintuplets is. The lines between the “good” guys and the “bad” guys is not as clear you might think it would be, and I can guarantee your opinion on this will be different than what it was at the beginning of the book when you reach the end. Although as stated, this book is written from a fictional perspective, I think the strongest part of its story and its accuracy is actually the format. The diary entries, certainly, because I bet some nurses and other caregivers would have kept some notes or wrote letters about what was going on, but more specifically the real news articles and columns The Quintland Sisters displayed periodically throughout the book. The ones that aren’t real are clear, at least they were to me, but the ones that were in fact real just brought the story more authority and integrity in my mind. Thus, I think the specifics invented for the story became more logical, which I personally think is crucial in historical fiction. I do think the ending does leave something to be desired, both in terms of wanting to hear more about the sisters as well as about Emma, but I realize the book did serve its ultimate purpose. 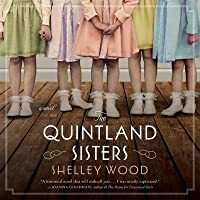 Overall, I think The Quintland Sisters by Shelley Wood is a wonderfully written and thoroughly researched historical fiction book. I highly recommend it if you are even passingly interested in historical fiction, particularly if you are Canadian. You can learn more about what I thought of this book on my Wordpress blog (Walking The Forst Floor). The full review for this book will be posted February 22nd, around noon. Historical fiction has never felt more contemporary! The Quintland Sisters is a captivating tale of historical fiction which holds up a mirror to today’s celebrity-focused world by reflecting back upon the appropriated lives of these helpless young quintuplet girls, as told through the naïve eyes of their fictitious midwife/nurse, Emma Trimpany, in the WWII era. Shelley Wood cleverly shines a light on our society’s fascination with “reality entertainment” long before the spawning of television s Historical fiction has never felt more contemporary! The Quintland Sisters is a captivating tale of historical fiction which holds up a mirror to today’s celebrity-focused world by reflecting back upon the appropriated lives of these helpless young quintuplet girls, as told through the naïve eyes of their fictitious midwife/nurse, Emma Trimpany, in the WWII era. Shelley Wood cleverly shines a light on our society’s fascination with “reality entertainment” long before the spawning of television shows like the Duggar’s and Jon & Kate Gosselin. Emma Trimpany comes off as an authentic narrator who chronicles the ways in which these children were manipulated by the government, the public, and perhaps their family – but also explores how a family in an extraordinary situation is affected by exploitation. I found that Shelley Wood’s writing flowed seamlessly, and I thoroughly enjoyed the format of Emma’s diary entries and letters, mixed in amongst newsy articles from the era, which provided verisimilitude and made it impossible to put down! I will not be surprised when this book ends up on the list for CBC's Canada Reads. It’s hard to believe this is a debut novel. It’s that good!